Madiwor is the first cloud based software solution designed for label manufacturers. Browse and plan your production orders on your machines and share the information with your team. Create price calculations based on your resources, store your price calculations and authorize when ready. Track and identify raw materials through the complete production process. Manage a precise finished product inventory, share this information with each customer through the extranet module. 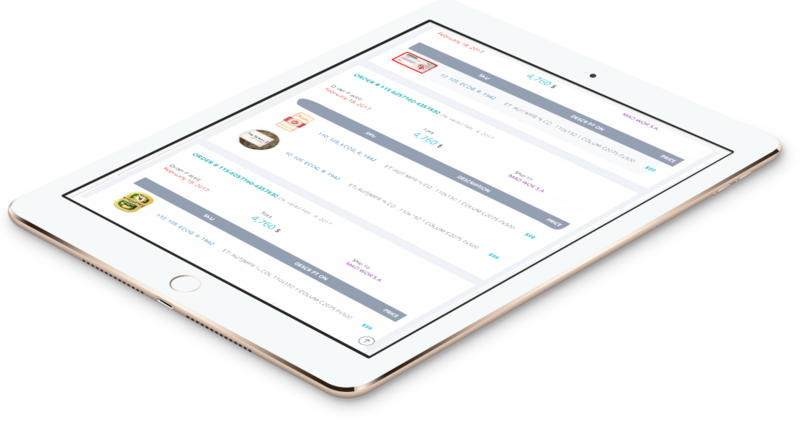 Madiwor´s Extranet functionality is the best way to develop customer loyalty. Assign jumbo rolls to production orders, cut rolls as required to optimize utilization. Our software is specially designed to be intuitive and easy to use. It assists your organization in key processes. Madiwor understands the challenges and provides the best solution. Madiwor provides perfect and flawless compatibility between all platforms. 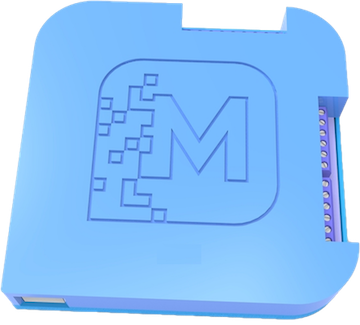 Madiwor´s design allows to use it on any device. Saves time needed for setup and training. Madiwor is already running. Easy to Use. Intuitive modularity improving the user experience. Eliminates the burden of upgrading, maintenance, and safeguarding data. Cuts operational costs. Plus Madiwor costs less compared to on-premises systems. Customers have access to a customized e-commerce application. 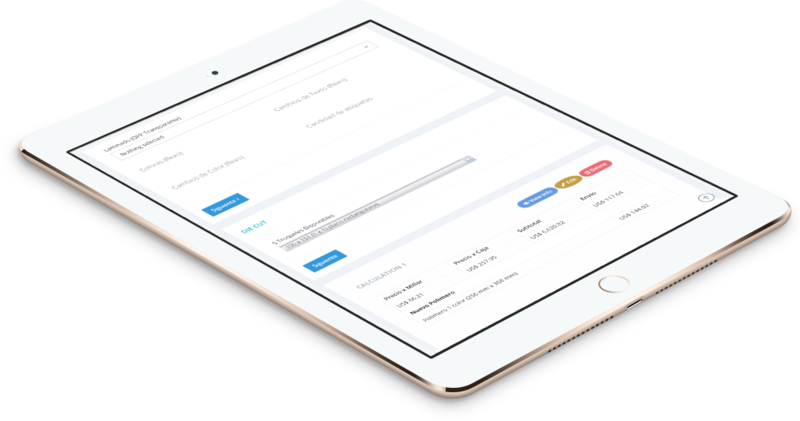 Allow customers to check the status of their orders, browse through order history and product specifications. Through the extranet your clients are able to order and send pricing requests. Create price calculations based on your resources and costs. Put together different alternatives to find the best alternative to your customer. Analyze new price calculations based on previous estimates and similar pricing strategies. The user interface is extremely easy and intuitive. The production plan shows a colored graph where you can quickly visualize the general status of the resources required for each work order. 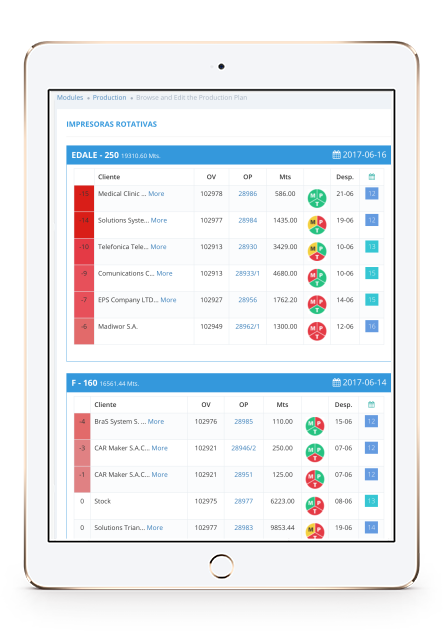 By automating the update of this indicator, Madiwor fully enhances the communication within the company. The great thing about this module is the not only it allows you to cut rolls into the size required by each order but, it lets you have them assigned to a production job or to the stock. This reduces scrap, saves time when retrieving inventory and automates the need to trace any material used. Using Madiwor Devices you can connect your press to the Cloud. Updated in Real-time. 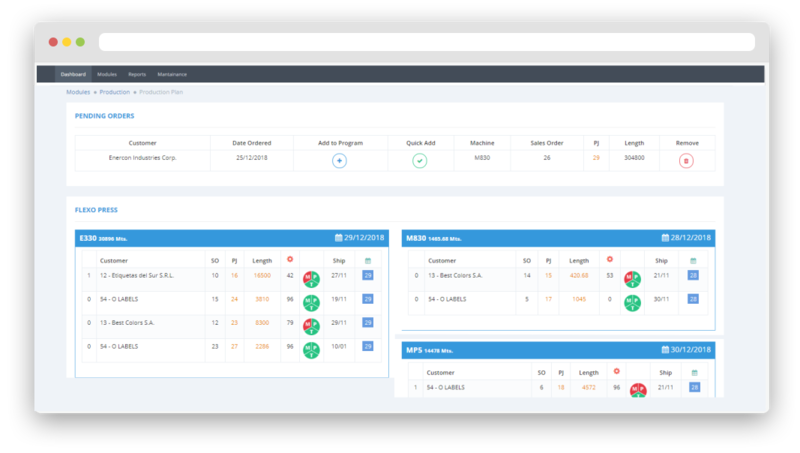 The Production Dashboard lets you monitor your production status. Monitor and Compare by reviewing a selected press and date.